Unsurprisingly, given that she was unable to bring herself to say that she supported the Leader of the Labour Party, Jeremy Corbyn becoming Prime Minister and given that her name has been repeatedly associated with talk of a split, coupled with her refusal to deny these allegations, members of Wavertree Labour Party decided that they would go about initiating the process of finding a socialist to become their next MP. Two members of Wavertree therefore decided to submit motions of no confidence in an MP who prefers Theresa May to Jeremy Corbyn. Luciana Berger despite having been Director of Labour Friends of Israel for 3 years prior to becoming an MP and who is currently Parliamentary Chair of the Jewish Labour Movement, which is the ‘sister party’ of the racist Israeli Labour Party, working closely with the Israeli Embassy, she has managed to portray herself as the victim of abuse and anti-Semitism. Berger has been the recipient of three verifiable anti-Semitic attacks on social media, the perpetrators of which have been gaoled. Most anti-fascists to say nothing of Black and Asian people find themselves on the receiving end of far worse fascist and racist abuse without being portrayed as media heroes or receiving police protection. Any anti-Semitic abuse is to be condemned but it is noticeable that the Labour MP who has been on the receiving end of thousands of racially abusive messages, Diane Abbott, is also the target of media vilification and abuse, such as that which she received from Fiona Bruce on Question Time. Given Berger’s inability to demonstrate an ounce of loyalty to him, Corbyn’s support for her is a remarkably stupid and self-defeating act of cowardice. According to the Guardian ‘A no-confidence motion in Berger was withdrawn following pressure from an evidently panicked leader’s office.’ Hapless and hopeless are just some of the adjectives that come to mind. The most obvious question to ask is whether or not Corbyn wants to be Prime Minister? 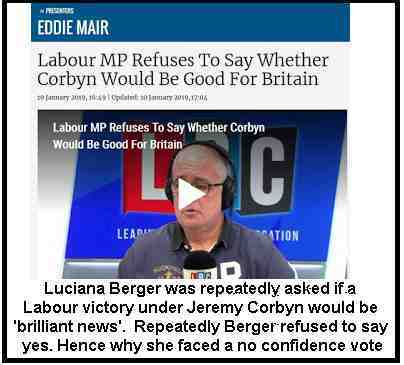 Luciana Berger has spent her lifetime playing the victim card. She resigned from the National Union of Students Executive in 2005 ‘because of a continued apathy within the National Union of Students to Jewish student suffering.’ One thing is clear. Unlike her victims Luciana Berger has never suffered anything. All this was the cue for Tom Watson to call for the suspension of Liverpool Wavertree CLP. He alleged that Berger ‘was being “bullied” and that local members were “bringing our party into disrepute". Since when is a party exercising its democratic rights ‘bullying’? According to Watson, despite Jennie Formby saying that ‘there was no constitutional basis’ for such a suspension, Watson told the BBC’s Andrew Marr Show that individuals were being investigated and that there were "grounds for suspension". What is the crime that is being alleged. A party member ‘branded Ms Berger a "disruptive Zionist".’ How is that anti-Semitic? The Labour Friends of Israel and JLM are overtly Zionist groups. Can anyone seriously deny that Ms Berger is disruptive and disloyal to the Labour Party? Where is the offence in telling the truth? Naturally the right-wing in the PLP gathered round Berger like flies around a honey pot. Shadow Health Secretary Jon Ashworth told Sky News that “I’m such a big fan of Luciana Berger," Given her rank disloyalty to Corbyn the obvious question is why Ashworth hasn’t been given responsibility for garbage disposal since he clearly has a considerable amount of his own to get rid of. 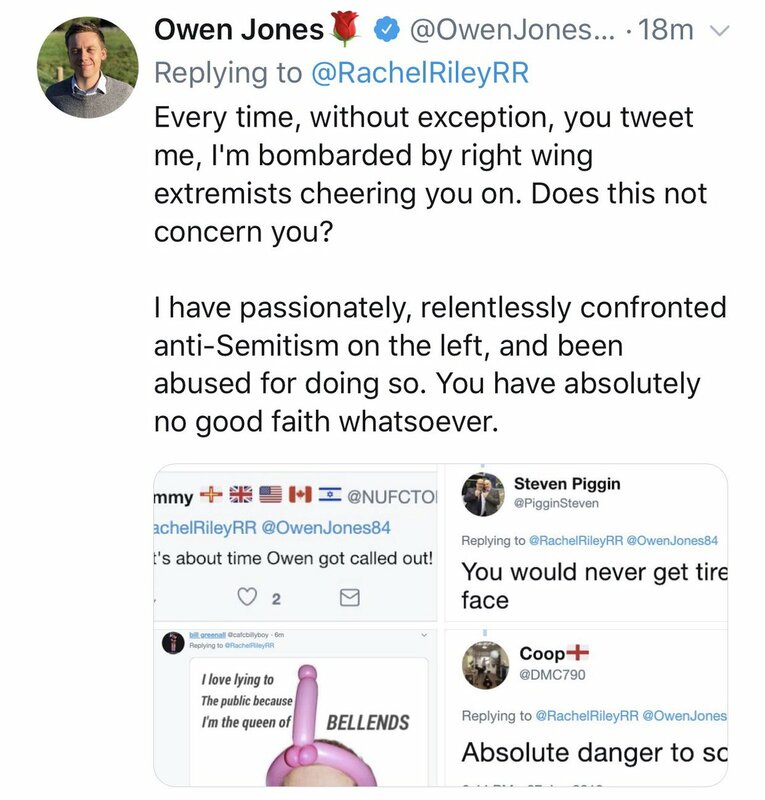 According to Ashworth “She’s stood up against anti-Semitism her whole political life, she’s got my full support.’ That is precisely what she has not done. She has stood up for Israel all her life. Not once has she condemned any aspect of Israel’s harsh rule over the Palestinians. Not one word of criticism was uttered when last summer Israeli snipers casually dispatched hundreds of unarmed Palestinian demonstrators to their deaths. The woman is a racist warmonger. Luciana Berger is an obnoxious, whinging, self-pitying narcissist who should have been removed from the Labour Party years ago. Naturally war criminal, Tony Blair, leapt to her defence, describing Berger’s treatment as “shameful”. Blair declared that “I think what Tom’s saying is absolutely right, I back him 100% on it,”. Which is proof that Corbyn should have slapped Watson down. All of this is happening because Corbyn didn’t stand up to the false allegations of anti-Semitism when they were first made. Many of them were made against himself. Instead, thanks to the useless advice of his Stalinist advisors, in particular Seamus Milne, Corbyn has repeatedly apologised thus adding fuel to the Zionist fire. The first rule in politics is that the best form of defence is attack. Instead of attacking the shameful record of support for Israel of his detractors he allowed them to get the upper hand. Every time he apologised they came back for more. To make matters worse Corbyn played ‘me too’ when Theresa May adopted the IHRA ‘definition’ of anti-Semitism. That too came back to bite him when he had bothered to actually read the thing. Instead of seeking to strengthen the Left in the PLP Corbyn has surrounded himself with rattlesnakes like Watson who should have been challenged for the Deputy Leadership last year. Berger has been one of the main proponents of the false anti-Semitism smears which led to my expulsion and that of other Jewish anti-Zionists. To them ‘anti-Semitism’ is support for the Palestinians and opposition to the world’s most racist state. According to Berger ‘"My values remain the same as they did when I was first elected.’ That is precisely the problem. Her values are no different from the Tories. In Labour investigates Liverpool members over 'bullying' of Luciana Berger Tom Watson told the Andrew Marr show that Corbyn had “made it clear these things are not done in his name” and they “are not helping him, they are harming the reputation of the Labour party”. If true then it is almost as if Corbyn has a death wish. It was an article of faith when the Labour Left was led by Tony Benn that constituency parties should have the right to deselect their MPs. This retreat from basic principles, following his opposition to Open Selection at the last conference are part of a disastrous policy of appeasement. Naturally Owen Jones, ever the opportunist, joined in. Writing in the Guardian this super ego opined that ‘Whatever Luciana Berger’s politics, Labour members must stand with her against antisemitism’. Luciana Berger isn’t under attack because she is Jewish but because she is a reactionary, racist member of the JLM and a paid up member of the Israel lobby. According to this media tart, Berger ‘not only deserves solidarity, but requires it’. In other words this peripatetic member of the Left believes Berger should be given a free pass to attack Corbyn and help split the Labour Party. 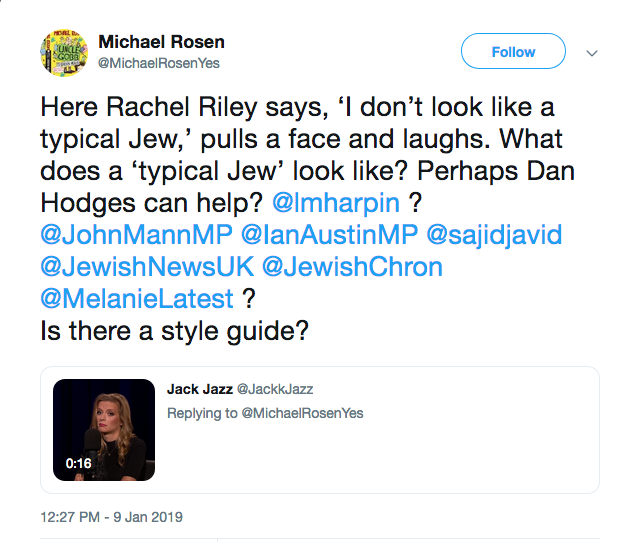 Idiot Rachel Riley, the latest expert on 'antisemitism' says 'I don't look like a typical Jew'!! One wonders what a typical Jew looks like? Big nose? Fagin? Antisemitism has always been the reverse side of the coin of Zionism. 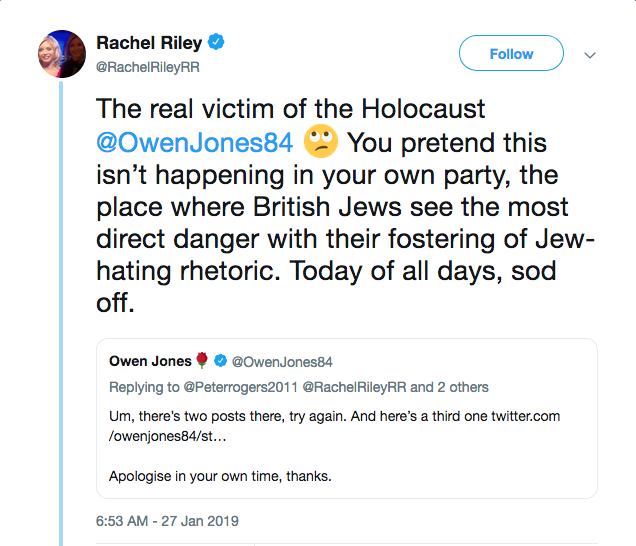 The irony is that Owen Jones, who has disgracefully attacked people like Jackie Walker, the recipient of vile racist abuse, has in turn been accused of anti-Semitism by Rachel Riley. Protesting his innocence he pointed to how he himself had made false accusations rather than drawing the conclusion that if he was falsely accused then so have others. Why is Owen Jones helping to subvert Corbyn? Naturally Jon Lansman, Momentum’s fuhrer, tweeted his “solidarity” with Berger, saying: “Whether you agree with her politics or not, whether you think she is the best possible MP for her constituency or not, she’s suffered appalling abuse. 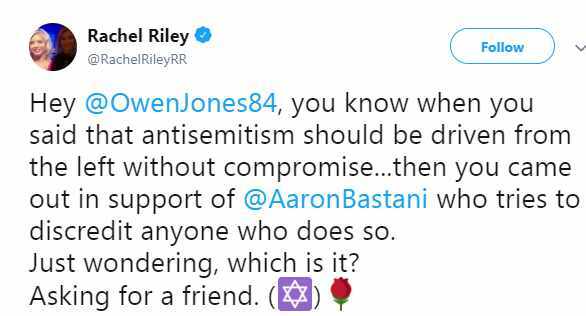 Must we always agree with people to show solidarity?” Nearly all this so-called abuse is from people outraged at her support for the real abuse that Palestinians suffer at the hands of her Israeli friends. But since Lansman is a Zionist that is of no concern to him either. It is becoming increasingly difficult to see Jeremy Corbyn becoming Prime Minister. He seems determined to destroy his own position, lurching from crisis to crisis. Instead of using his advantages such as the 2017 election gains, to turn the tables on the Right he has defended them at every turn. 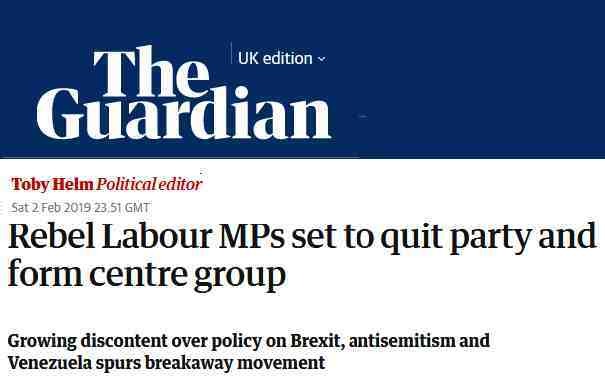 Even today, when as implacable enemy as Luciana Berger is being held to account by her own party, instead of defending their democratic right to do so Corbyn’s unnamed advisers (Milne, Fisher) urge the party to pull back. Coupled with his hopeless position on Brexit when it is clear that the majority of Labour Party members want a second referendum and when it is equally clear that Brexit will be an economic and political disaster, Corbyn acts like a sullen child, digs his feet in whilst refusing to articulate any coherent position. Trapped as he is by the legacy of the British Communist Party’s socialism in one country i.e. economic nationalism. To paraphrase John Donne’ ‘don’t ask for whom the bell tolls it tolls for thee’. It is the lack of any criticism by Corbyn supporters, many of whom believe adulation in itself will enable him to set foot in Number. 10 that is driving Labour into a cul-de-sac which will lead to Corbyn’s resignation and a Tory victory at the polls. The time to change direction is becoming shorter and shorter.